Chancellor Angela Merkel, while visiting Greek President Prokopis Pavlopoulos on Friday (above), said it was unacceptable long-term that "some European nations say this [migration] problem doesn't interest us at all." Alluding to Visegrad Group aversions to asylum-seeker relocations to their nations within the EU, Merkel said members such as Greece on the EU's Mediterranean frontier were "not being given an adequate answer" on how they were to cope with migrant arrivals. Pavlopoulos said the problem could only be tackled jointly within the EU and went on to describe Merkel's 2015 decision to welcome "Balkans route" asylum-seekers to Germany as a historic, courageous move despite the controversy it caused. The UN Refugee Agency recently said 32,000 people entered Greek islands from Turkey last year — compared to a 2015 peak of 850,000, which resulted in an EU-Turkey pact to identify asylum-seekers and send back so-called economic migrants. 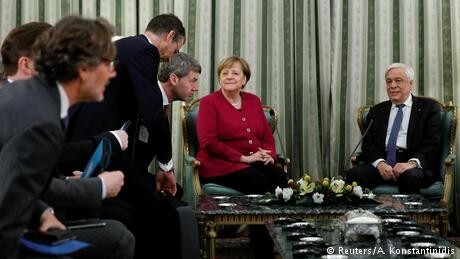 Visiting a German School of Athens on Friday, Merkel told pupils she did not accept her critics' assertion that receiving refugees sent the "wrong signal." "I don't believe in deterrence, meaning that I must make things terrible enough so that no one will come anymore," she said, adding that the answer lay far more in developing humane perspectives in the refugees' countries of origin. Questioned by pupils, Merkel acknowledged that the EU-Turkey deal was dysfunctional, causing what she termed "this pressurized situation of the Greek islands." "There are many Iraqis, many Afghans and many others for whom we have no solution in the deal. Europe needs to take care of that too," Merkel admitted. To relieve chronic overcrowding on Greek Aegean island reception camps, Greece recently brought thousands of asylum-seekers to its mainland, but on Wednesday Oxfam say many others, including unaccompanied children, had been abandoned. The EU's "hotspot" screening system on islands had from the start been unable to cope, Oxfam said, citing cases of pregnant women being sent from camp clinics back to tents. The issue had been discussed on Thursday with Greek Prime Minister Alexis Tsipras, Merkel added. Challenged by President Pavlopoulos on persistent Greek legal claims to billions in euros of reparations for the Nazi German occupation of Greece during World War Two, Merkel replied, "We are aware of our historical responsibility." "We know how much suffering Germany caused Greece during the era of National Socialism, so the lesson for us is to do everything we can to ensure good relations with Greece and to support each other for the benefit of both countries," Merkel added. Berlin argues that its payment to Athens of 115 million deutschmarks in 1960 (€59 million in today's currency) — coupled with a 1990 treaty at the moment German reunification — settled the issue. In 2014, former German President Joachim Gauck sought forgiveness from relatives of Greeks murdered by the Nazis in northern Greece. Three years ago, a Greek parliamentary commission put outstanding war reparations at €289 billion euros ($333 billion). The issue of past injustices resurfaced during Greece's 2010-2018 economic bailout phase, with Germany targeted for painful cuts imposed by international creditors. During at a Friday protest by Greek school teachers angered by a Tsipras government plan to hire new teachers, some demonstrators removed and damaged a wreath that had been laid earlier by Merkel at Athen's Unknown Soldier's monument.